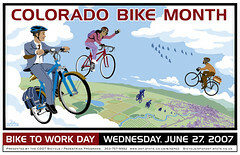 June is Colorado Bike Month; Colorado Bike To Work Day is Wednesday, June 27, 2007. No matter where you live, I think it’s appropriate to celebrate Colorado Bike Month. I wanted to portray the sense of freedom one has with riding a bicycle and apply it to bike commuting. Many of my initial sketches were of cyclists in bike lanes riding through the streets of a generic "anywhere" Colorado. There’s nothing wrong with that but I kept wondering how I could push it conceptually further? Hence, flying bicycles! This gave me the opportunity to not only capture a scene but an emotion as well. Fun and free! While I omitted the more common commute of motorized vehicles, the use of bicycles in migratory formation and in line approaching a city like airplanes to a runway, hints at replacing one’s usual mode of transportation with a trusty two-wheeler. This supports one of the greatest goals of bicycle culture, to ride rather than drive. The scene also captures "anywhere" Colorado as the poster was not to be specific to any one place. Mountains, plains, city, small town, rural farms – it’s all there! And to add a personal touch, the blue bike is drawn from my own bicycle. Steve Lowtwait is a professional poster designer in Boulder, Colorado. He grew up in the burbs of Chicago, IL, and worked as an animator for Nickelodeon in Los Angeles. Steve is a recreational road cyclist and cruiser rider. Steve says, "I work out of my home but I’ll go for a ride on Bike to Work Day simply to get in the spirit!" This image is Copyright 2007 by Steve Lowtwait and is used with his permission. All use must attributed to Steve Lowtwait, 2007. What’s up with the yellow BTWD shirts?? Over the last four years (including this one) DRCOG has used yellow for the colored shirts three times. I’m ordering Boulder’s shirts this year! Besides touting a WEEK of alternative transportation (rather than just a single day), they’re printing their colored shirts on a muted green this year.